The exciting life of being a resident doesn’t afford me much time to cook. Usually, I bake, because I seem to have better luck baking than cooking. D’s the chef; I’m the baker. However, I like to do my part when I can, and I’d rather not leave cooking for just special occasions. My goal is to cook at least one dinner for us a week, but depending on my schedule, that doesn’t always happen. I had the day off today, so earlier in the week I planned to cook dinner tonight. I’m a recipe follower, and recently D dug out from still packed moving boxes my copy of Veganomicon: The Ultimate Vegan Cookbook. I bought this book a couple of years ago when I was on my second attempt at going vegan (third time’s a charm, eh?). Infamously, I once tried to make seitan from a recipe in this book, and I failed miserably, though I’m sure the failure was due to the user, not the recipe. Because I’d failed I was afraid to try to make anything else from this cookbook…until now. 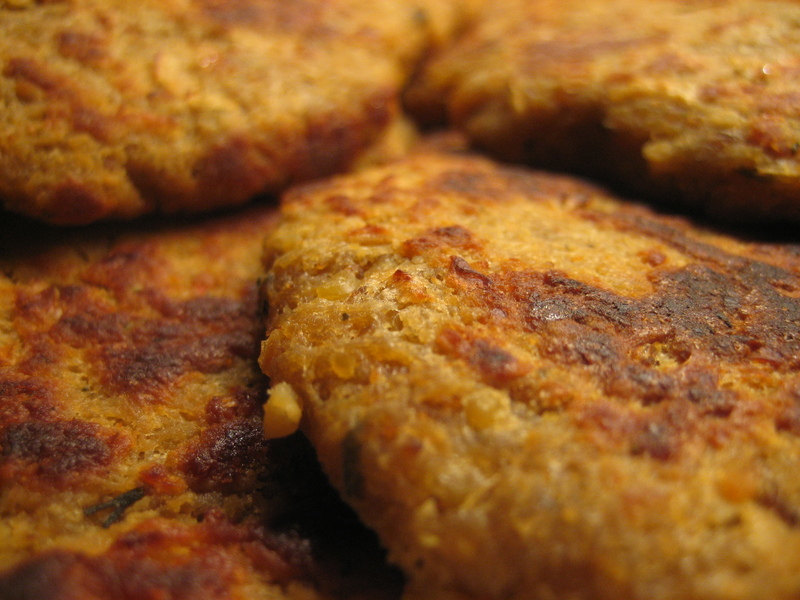 With a tighter resolve to be vegan and a newfound like (though, slowly I will admit, although D’s gyros are the bomb, but I digress…) of all things made with vital wheat gluten, I decided I’d make Veganomicon’s Chickpea Cutlets. 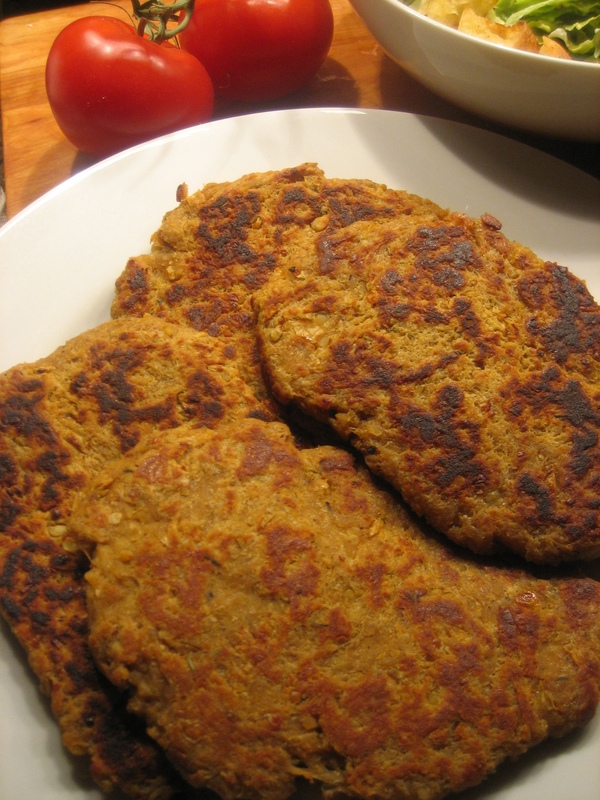 I used vegetable broth as opposed to water and lightly fried them in olive oil in a skillet rather than baking (the baking option was listed in the actual cookbook and not in the posted link). I am including a view from above the plate so that the perspective can be seen of their size, but I’m also posting an up close shot, as it shows more detail texturally. I believe we’re the last vegans on the planet to try these. I think the flavor of them is very tasty, but I think next time I’ll make them even thinner just so they’re a bit crispier on the inside. 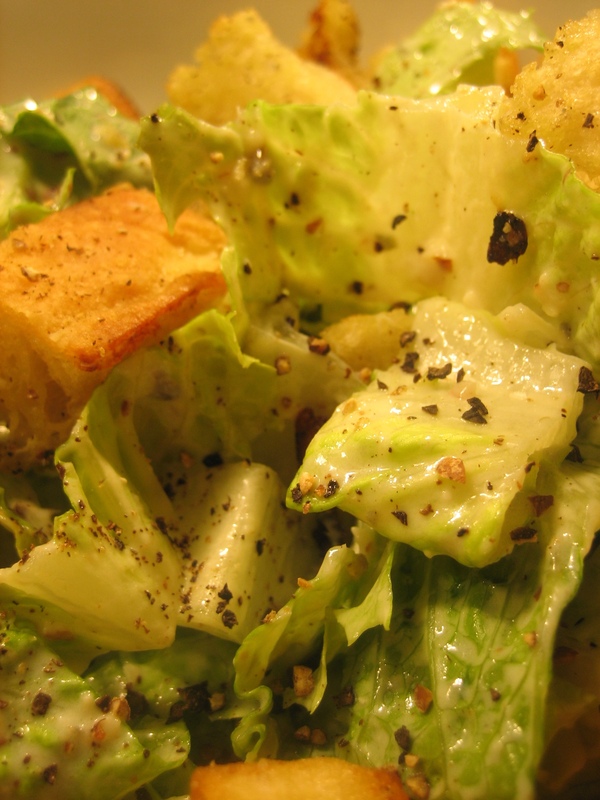 With the cutlets, and also from Veganomicon, I made a vegan Caesar salad with homemade ciabatta garlic croutons. OMG, yum. D would have been blissfully happy had I only made this, but she said she really liked everything. She said she just hadn’t realized how much she’d missed Caesar salad until tonight. She also kept snaking croutons when my back was turned, and I had to chase her out of the kitchen. Heh. The only thing I did differently from the recipe was add approximately a teaspoon of vegan Worcestershire sauce. 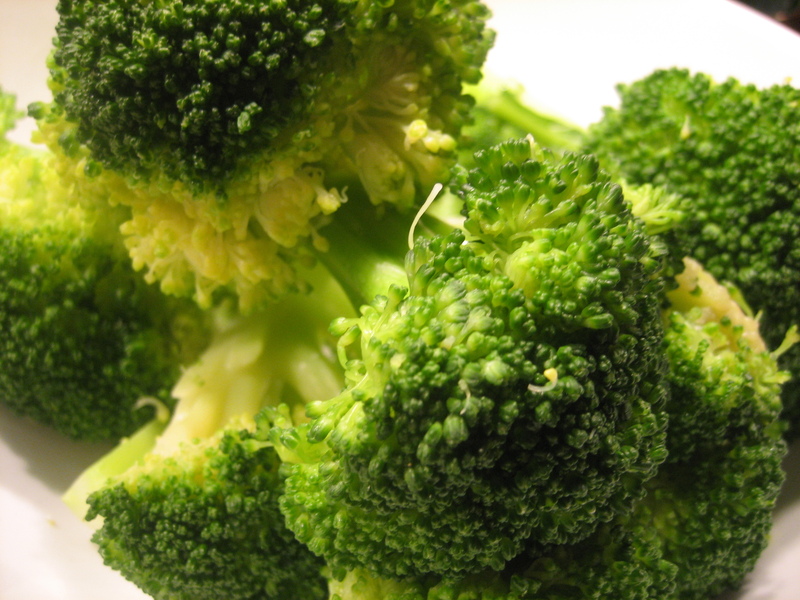 Finally, I just steamed up some broccoli in our bamboo steamer. I added nothing to it, because broccoli is so, so, so good unaltered (though we do sometimes sprinkle a bit of freshly squeezed lemon juice over it from time to time).